CoinImp is the PUP that uses misleading techniques to prevent removal. Use Reimage to locate malicious components and get rid of them faster than with uninstall instructions. A full system scan blocks virus reappearance and prevents traffic to malicious domains. Similar malware Coinhive Miner, RubyMiner, Minergate virus, Monero Miner, etc. Removal To immunize CoinImp Miner from the system specialists recommend using professional anti-malware tools. Reimage is a reliable tool for this task. If used properly, CoinImp miner is not malicious in any sense. Contrary, digital currency specialists point out that this service is noteworthy due to the lowest fee (1%) in the market, the usage of Referral Program, the simplicity of API key, 24/7 customer service, and other features. CoinImp Miner is allowed users to customize the usage of visitor’s CPU resources. Conscientious users of the server do not tend to disable the limited resource usage. In the meantime, hackers opt for disabling all limits to utilize 100% of CPU. High resource consumption, especially on older devices with older fans, can lead to severe system’s crash, data loss, and hardware problems. Although the website embedded with the CoinImp virus should stop sucking up CPU, the standard practice shows that it might continue its job by displaying a hidden pop-up under the window on Windows startup. If you are satisfied with the service and does not spot its associations with untrustworthy parties and malware, you are free to use it as much as you want. 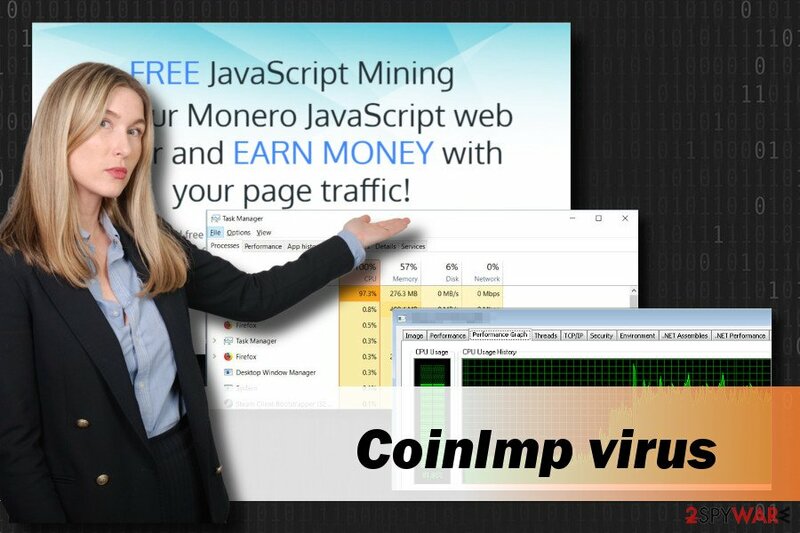 However, to prevent hackers from stealing your CPU resources and gaining illegal profit by rendering your PC useless after visiting particular websites for a longer time, NoVirus.uk experts recommend you to remove CoinImp Miner from the system. 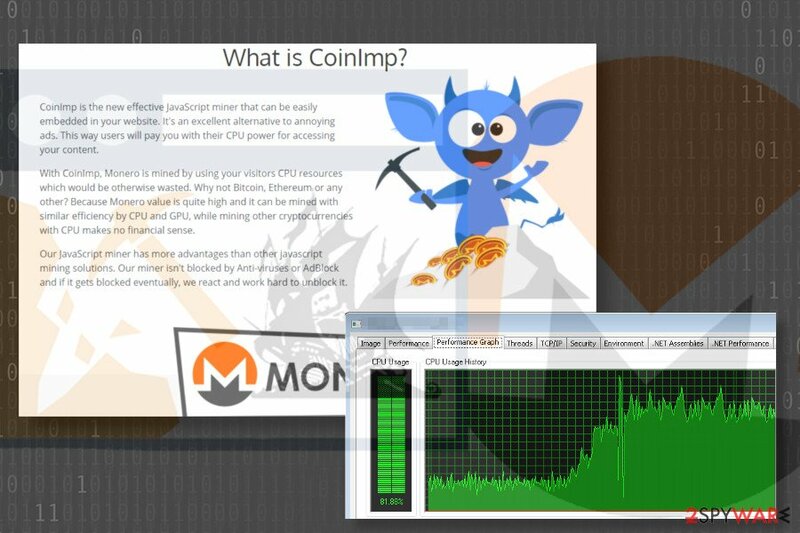 Although developers claim that the Monero miner evades anti-virus and adblock detection, try to remove CoinImp website miner with Reimage or another reputable security tool. If not added yet, it’s only a matter of time when it will be included in the most popular antivirus databases. This particular Monero miner is offered as a legitimate free service on the official website. Those who opt for using it has to register to the service and generate unique links via the app. However, if hackers misuse it for illegal Monero mining, the JavaScrip code can be injected stealthily via hacked websites, potentially unwanted programs (PUPs) or even as an independent app. Tech-Support-Scam sites that pop-up in the form of a new tab and completely locks the screen are the best example to illustrate the illegal usage of cryptocurrency mining scripts. Such domains might warn the visitor about the virus, spyware, rogueware and another infection and urge him/her to contact certified technicians. Potentially unwanted programs, like adware and browser hijacker, are yet another medium allowing crooks to drive visitors traffic to miner embedded web domains. These apps can hide in the system for a long time displaying dangerous ads and links among user’s search results. Usually, PC users start suspecting an unwanted program to be installed when the web browser starts generating such a high number of ads that it becomes difficult to browse. 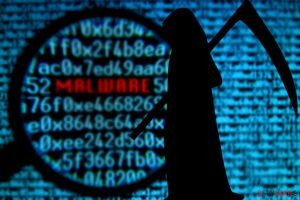 More often than not, malicious cryptocurrency miners are spread in the form of independent apps. Although you can hardly find them as stand-alone installers, apps like CPU Miner or Coinhive can be found bundled with freeware and shareware. Cryptocurrency miners do not manifest their presence. They do not the corrupt system in a remarkable way. However, if you are a heavy PC user, the symptoms of PC’s sluggishness and unresponsiveness should draw your attention. Besides, you should also notice an excessive number of ads within web browsers, which redirect to unusual, rogue or malicious domains all the time. To check what is happening with the system, you should open Task Manager and verify what processes are currently running and how much CPU do they take. If CPU consumption exceeds 50%, we would recommend scanning the system with Reimage, Malwarebytes MalwarebytesCombo Cleaner, Plumbytes Anti-MalwareMalwarebytes Malwarebytes or another antimalware for crypto miners or other malware. ^ Catalin Cimpanu. Hackers Make Whopping $226K Installing Monero Miners on Oracle WebLogic Servers. BleepingComputer. Technical support site . ^ Here’s How Monero (XMR) Could Soon Be At $1,000. Global Coin Report. A news service focused on serving the Crypto Currency trading community. ^ Lily Hay Newman. Your browser could be mining cryptocurrency for a stranger. Wired. Online news site. This entry was posted on 2018-03-15 at 17:38 and is filed under Malware, Viruses. You can quickly scan the QR code with your mobile device and have CoinImp virus manual removal instructions right in your pocket. How did you remove CoinImp virus?